Now that you have decided to invest in a sewing machine, you must have come across many brands. One brand that we’re sure you’ve definitely heard of is Singer. If you’ve been planning to buy a sewing machine by Singer, then you might have been caught up in a whole other dilemma. After all, which Singer machine should you go for? If the Singer 2277 was on your list of potential purchases, then you are in luck! 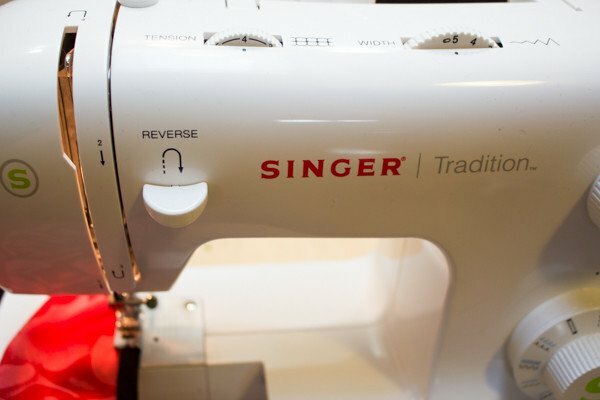 In this post, we’re reviewing the Singer Tradition 2277 so you can determine if the machine is the one for you. 12 What kind of fabrics can the Tradition 2277 handle? 13 How good is the built quality of Tradition 2277? 14 Is the price worth it? 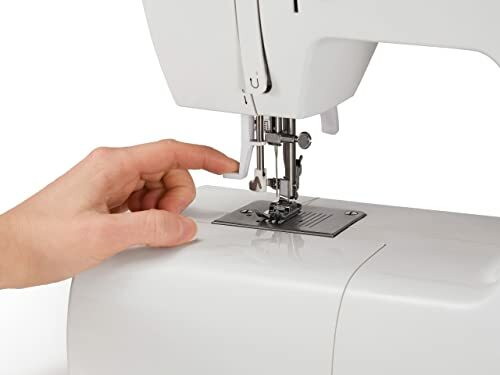 The Tradition 2277 is perhaps the best for those looking for a strong sewing machine within a short budget. Since people starting to sew for the first time don’t want to buy an excessively expensive machine, the Tradition 2277 is their machine of choice. Similarly, beginners want a strong sewing machine that has the basic features and is strong enough to handle wear and tear. However, if you’re an advanced sewer, then you should definitely skip this review! Only beginners can benefit from the Singer Tradition 2277. The Tradition 2277 is a full-sized sewing machine. Since it is quite wide, it offers more workspace which is very helpful for beginners. Despite being a simple machine, it has all the crucial features that a beginner needs to get started. On the market, you’ll find sewing machines for beginners to have low cost and thus low build quality. However, Singer machines are famous for their excellent build quality, and this isn’t any different! In fact, some intermediate sewers might also go for due to its build quality. Basic accessories and sewing features of Tradition 2277. Before we move on, let’s take a look at the accessories and the basic features of the machine. Remember, it is a sewing machine for beginners so it must be easy enough to operate. At the same time, it should also be able to maintain the number of manual adjustments that sewers can do. Here are some of the features of Tradition 2277 worth discussing. 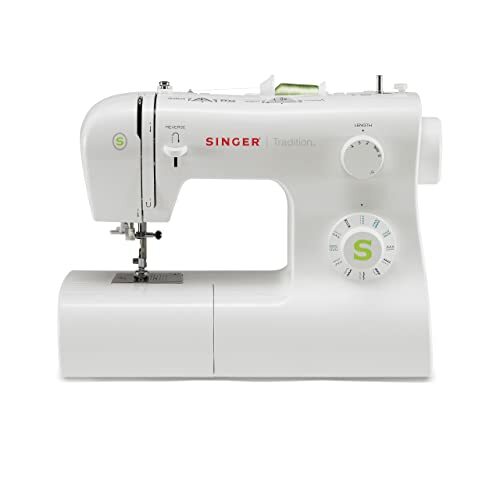 Like many beginner-level machines, the Singer 2277 also comes with a free arm. Often there are tiny circular parts of the fabric that are difficult to reach. To work with those, you must snap off the area underneath the needle and access the free arm. Once you have dealt with those hard to reach parts, you can snap it on again. Then, you can continue working on other parts of the fabric. One might argue that a free arm is not really needed for sewing long and straight pieces of fabric. However, the feature is quite useful for handling the curved parts like cuffs and collars. Since the machine is designed for beginners, the table’s size is more than adequate for beginners. However, for some, the average size of the table might not be spacious for you. This particularly applies if you’re using the machine for quilts. Just like most modern sewing machines, the Tradition 2277 also comes with a standard foot pedal. In other words, the foot pedal works as an on and off button for the machine. The foot pedal is also thought to be an excellent ergonomic feature. 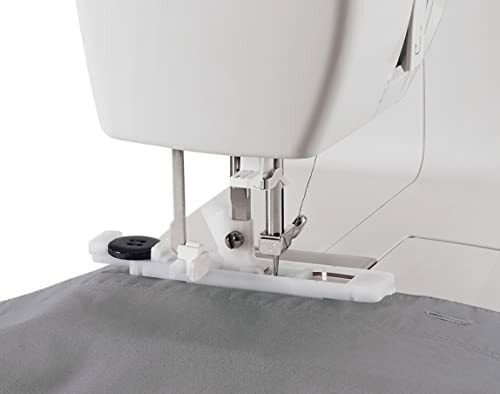 When you use the pedal to start or stop the sewing process, you basically have your hands free. This way, you can simultaneously work on different sewing operations. These feet are just enough for you to carry on your regular sewing projects. However, for advanced projects, you will have to buy other presser feet. If you are in luck, then you might be able to use a presser foot from your previous sewing machine. However, it should be compatible with the Tradition 2277. The Tradition 2277 also allows you to do reverse stitches. You simply need to push the reverse lever which will reinforce the result. You will also need to secure the fabric’s thread at the beginning as well as at the end of the stitching line. 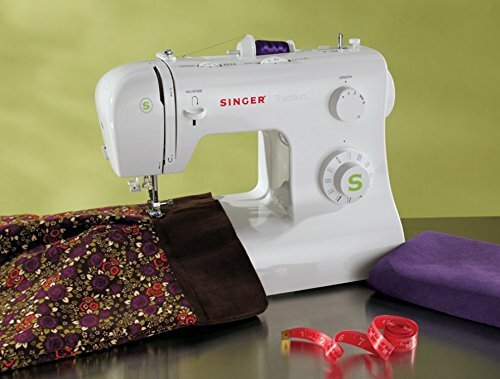 Another impressive feature of the Singer 2277 is that it allows you to create decorative and satin stitches. How is that possible? Well, you just need to use different width and length of the stitches. The maximum stitch length is 4mm while the maximum width goes up to 5 mm. You can take advantage of a longer stitch length if you are dealing with heavy fabric. Meanwhile, smaller stitch length is suitable for lightweight fabric. You can easily adjust the stitches using the manual control. For beginners, this feature is highly useful as it is beginner-friendly and automated. With this feature, you only need to set the location of the buttonholes then place the fabric. Now, let the machines do the rest! As a sewist, you will often have to wind the thread into the bobbin. So, having an automatic bobbin winding helps the sewist save a tremendous amount of time. You simply have to put the bobbin in the slot, and the machine will wind the thread into the bobbin. No one can really agree that sewing is an easy task. However, once you get into the routine, it is easy to do it time and again quickly. But one task that never gets easier with time is threading the needle. This particularly applies to those with weak eyes. Regardless of the number of times you perform the task, it is always difficult to put the thin threads into the tiny needle hole. You’re in luck though! The Tradition 2277 has an automatic needle threader that makes the task easier. The automatic threader is a basically a tiny in-built device fixed near the needle. It swings through the needle’s eye thus helping to put the threader in place. What kind of fabrics can the Tradition 2277 handle? Since this is a general full-size machine, it can handle various kinds of fabrics. This also means that it can handle varying fabric with varying thickness and weight, ranging from denim to silk. However, it must be mentioned that different fabrics might need different needles. So, you must ensure that you use the right needle keeping in mind the fabric you are sewing. For some fabrics, you need special needles as well as presser feet and thread. You must also know that the machine won’t give great results when it is used to sew multiple layers of any thick fabric. So, if you try to sew numerous layers of denim together, then the result won’t be the best. How good is the built quality of Tradition 2277? While the casing of the machine is made of plastic, the machine’s core is made using a heavy-duty metal frame. Overall, the skeleton of the machine is quite rigid and holds the mechanism in perfect alignment. As a result, you get to enjoy a long-lasting and durable machine as well as a skip-free sewing experience. The built quality of the Tradition 2277 is quite exceptional considering that it is an entry-level sewing machine. In fact, you will hardly find the same built quality in other beginner machines. At the same time, the pricing is that of a beginner level machine. So, you can get the machine at an affordable price. The warranty of any machine greatly influences the consumer’s buying decision. The warranty is an indication that the manufacturers are sure of their product. For this reason, the Tradition 2277 comes with 25 years of limited warranty. The Tradition 2277 is a reliable sewing machine that is built specifically for beginners. What makes the machine ideal is its extended warranty, excellent build quality, and the affordability. However, the Tradition 2277 might not be ideal for those willing to have complete control of all the sewing features. Similarly, expert users may like professional sewing machines more. As a beginner, this is the one you should go for. Then when you become a little more about sewing, you can move on to a more advanced level. At that time, you can use the Tradition 2277 as your backup!